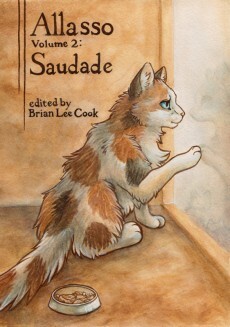 Saudade, a Portuguese word, envelops the complex emotions found in loss, solitude, anticipation, and hope. In this volume of Allasso, this forlorn feeling lies prevalent in many characters’ minds. Some may feel it when losing a loved one; others feel it after exhilarating experiences. A few even feel it with completely imagined memories. Here is volume 2 of Allasso, the semiannual book/magazine ”dedicated to finding new experiences within anthropomorphic writing and art”. Volume 1 was a promising beginning. Volume 2 is larger; 127 pages versus 110. Is it better? Woods Cross, UT, Pink Fox Publications/North Charleston, SC, CreateSpace, May 2012, trade paperback $7.99 (127 pages), Kindle $3.99. 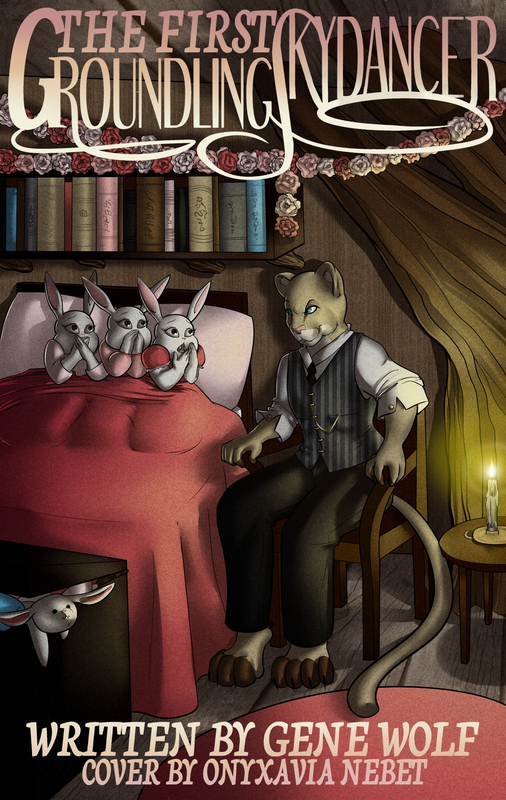 “Magtwilla and the Mouse” by Mary E. Lowd, this volume’s Editor’s Choice Award for Best Dramatic Work, is a successfully moving heartstring-tugger. Magtwilla, a pregnant feral cat, charms the primate Todd into taking her in as a housecat so her kittens will be raised in safety and security. Twillatha, Magtori, and Jenwilla are little furballs deserving of a mother’s full love and pride; Twillatha showing precocity as a natural huntress, Magtori being prudently cautious, and Jenwilla comfortable in her domesticity. But Magtwilla is horrified when Todd takes them away, one at a time. 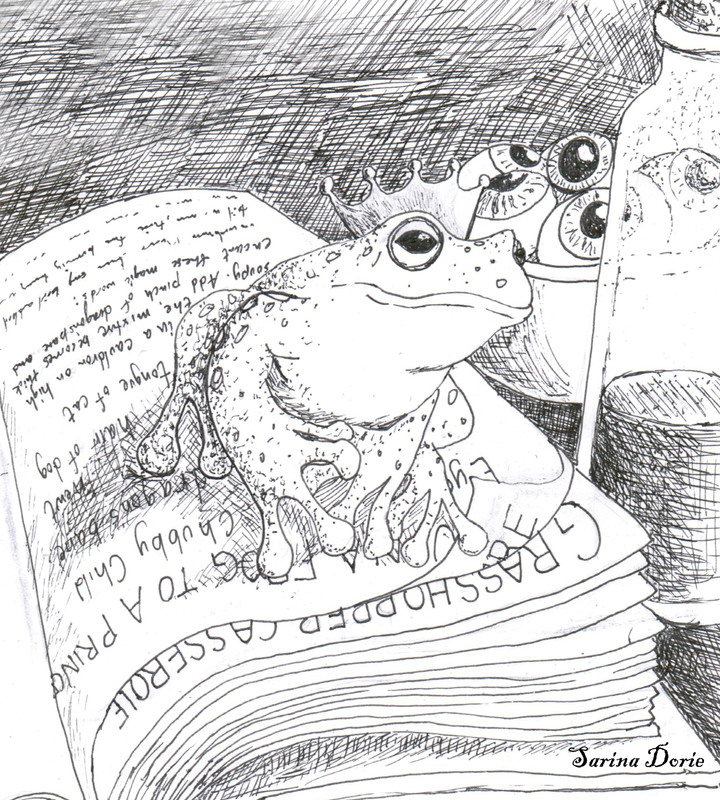 The reader will recognize that Todd is finding good homes for them, but all that the grief-stricken Magtwilla knows is that her babies have disappeared forever. In her loneliness, Magtwilla secretly adopts the mouse that she should be hunting as a surrogate kitten. Lowd knows how to write a real tearjerker. “Greener on the Other Side” by Sarina Dorie is the winner of the Editor’s Choice Award for Best Comedic Work. 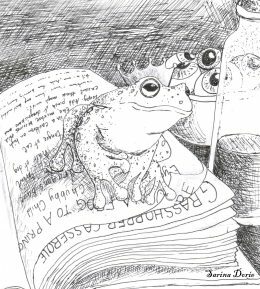 The story is narrated by Prince Charming, a frog who desperately tries to find the spell that will make him human again while Morwynne the semi-wicked witch is at the Witch-mart buying new spellcasting ingredients. No belly-laughs here, but there is a steady stream of chuckles. In “Rearview” by Sean Silva, the narrator’s car breaks down on a lonely road at night. A passing motorist offers to drive him to his destination. But the narrator is an anthro pig, and his would-be benefactor is a wolf. Can the pig trust the wolf? “Beyond Mundane Horizons” by Altivo Overo features talking 'real' animals. Naryssa, an elderly but spry vixen, meets a horse for the first time. So she does not realize at first that this is not a normal horse. This is a wish-fulfillment tale for shapeshifters. “The First Groundling Skydancer” by Gene Wolf is a bedtime story that Fred Puma tells his three young rabbit daughters. The story is really a flashback to the time when Fred and George Wolf tried out the latter’s flying-machine invention, and explains how the puma comes to have three rabbit daughters. Judging by the story’s illustration, Gene Wolf intends to publish this separately as an e-book. “Back Road” by James Steele gets the Editor’s Choice Award for Best Overall Entry. A nameless human driver on a back road at night sees another car hit a red fox vixen. He stops to try to help the fox, who is still alive but dying. They form an unexpected bond. A somber mood-piece. “Price” by Kassie K wins the Editor’s Choice Award for Best Poetry. In fact, it is the only poem in this volume. If you read my review of vol. 1, you know what I think of poetry. “One Sheep” is Mary E. Lowd’s second story in this volume. Once there were sixteen sheep on a farm. Lowd tells in ten-little-Indians style what happens to them. I identify with the four sheep who pool their money to buy a used submarine. In “Tiger Light” by Alice ‘Huskyteer’ Dryden, Jed and his teen pals take some wild stuff and they turn into cool animals. Stef is a platypus, Bruce is a tortoise, Humpy is a mongrel dog, and Jed himself is a tiger. They decide, giggling, that as animals they don’ need no steenkin’ clothes, so they get naked and go out together. Just how much has the wild stuff really changed them? “No More Monday Memos” by Tristan Black Wolf gets the Editor’s Choice Award for Best Use of Anthropomorphism. 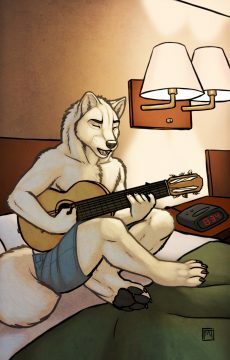 Darius, the driver-narrator, is human; Angelo, a wanna-be singer-songwriter hitchhiker, is an anthro arctic fox. It is a mixed human-anthro world with the anthros a prejudiced-against minority. Read the story to see what happens. So: is volume 2 better than volume 1? Yes, from the viewpoint that it has less poetry. (I don’t like poetry.) 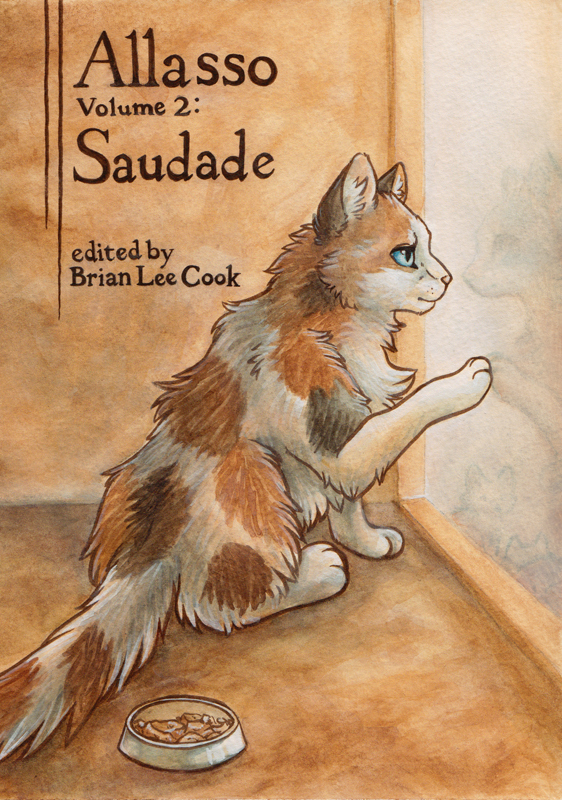 There are only four illustrations (volume 1 has six), but they and the wraparound cover by Silent Ravyn all illustrate stories instead of being generic anthro art. The meat of the volume is the ten short stories. Are they better than the stories in volume 1? Well, no; they are about the same: a mixture of drama and comedy, narratives and mood-pieces. Some are better than others; all are readably good. If you enjoyed volume 1, you will enjoy volume 2. The publisher supplied this review copy. Maybe by volume 3, every contributor will win an Editor’s Choice Award. Arguably every piece was the editor's choice! ;-) In fairness, cash prizes are given for winning the Editor's Choice categories, and submitters are not otherwise compensated, so it's a way of providing both kudos and a material reward. Heh, yeah, I know I put a lot. I'd love to pay everyone. If I ever have the cash to do so, I probably will. I haven't actually done the math on this, so I may be completely off -- but it seems like if you'd reduce the prize amounts (say, to half, which would still be a nice amount to win), you might have enough money freed up to pay contributors at least a token amount like a half cent a word. (I don't know about the art aspect of it and what the usual pay rates are for that, though.) Just a thought, anyway. I doesn't seem to say it on the guidelines, but my experience with being in both Allasso 1 and 2 suggests that authors are given a contributor copy of the print version. C'mon Fred, just because you don't like poetry doesn't mean we all hate it. Some of us take serious enjoyment from reading it. Perhaps we would need a poetry reviewer in that case, I don't think he was implying we should all hate it because he hates it, it's just that he's not going to be able to give you a good review because of that bias so he doesn't want to waste one's time. Right. I do not feel competent to review poetry, so anything that I say about it would be pretentiously meaningless. True. So let's be blunt. I am not enough of a litterateur to tell whether the poems are any good or not. I did enjoy one poem in Volume 1. Volume 1 has seven stories; volume 2 has ten. The stories are of varying qualities, but none are outstandingly good or bad. I rate "Best of Breed" and "Fetching Asteroids" in volume 1, and "Magtwilla and the Mouse", "Greener on the Other Side", and "One Sheep" to be very good; but judging the stories is so subjective that I cannot really say that these are "better" than the others. Other readers may have other favorites. So, is volume 2 "better" than volume 1? They are about the same in quality, but volume 2 is longer and has more stories and fewer poems, so I liked it better. Someone who likes poetry might rate volume 1 as the better.